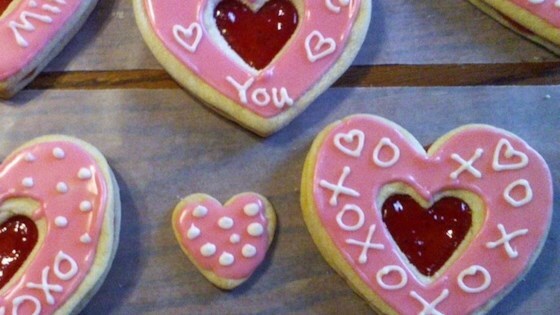 "This recipe makes 17- 3 inch sandwich cookies and 17 - 1 1/2 inch heart shaped cookies. You'll need a 3-inch heart shaped cutter and a 1 1/2-inch heart shaped cutter. Frost with Pink Valentine Frosting (see recipe)." Very easy to make and the taste is great. But be sure to place cookie at least 1 inch away from each other, they really "grow" during baking.